windrushapartments.co... Contact Windrush Appartments Bed & Breakfast Accommodation Bourton .. It is hosted by 1 1 Internet Ag Baden-wurttemberg, using Apache web server. 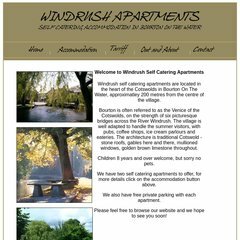 Windrushapartments.co.uk's IP address is 217.160.57.171. There are 2 Nameservers, ns34.1and1.co.uk, and ns33.1and1.co.uk. PING www. (217.160.57.171) 56(84) bytes of data.